Here in the Steamy South, school goes back in August. I assume that’s because June is lovely and breezy and August is sweltering and intolerably hot, so why waste June in the classroom when you can while away the hottest days of August there, in the A/C? So yesterday, I packed my eldest off with her brand-new lunch bag and sent her along to school. Monday, I’ll do the same with #2 and #3. And as they begin a new school year, I’m beginning some projects of my own–the reinstitution of naptime around here is about to make me a much happier mommy. 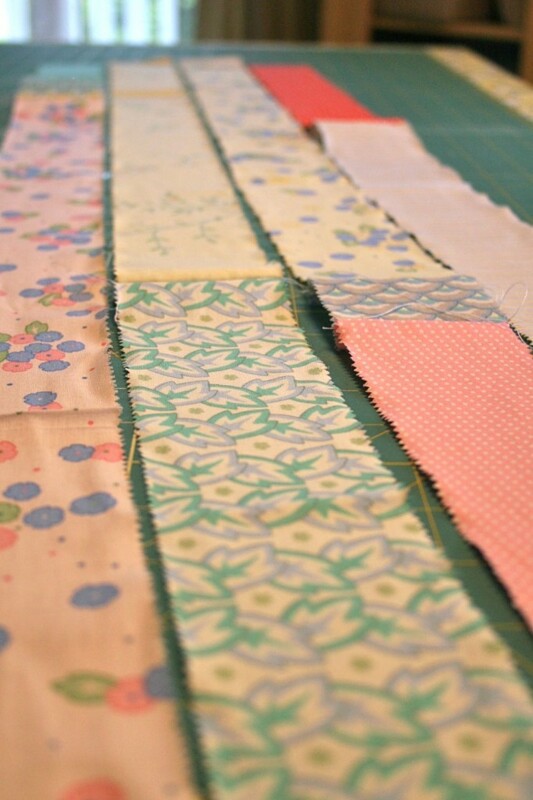 Off to a good start is the City Weekend lap quilt for the shop, made with one jelly roll and one petit four (the latter scored at Quilt Market in Houston). I am over the moon over this collection, and have almost as big a crush on it as I do on designer Liesl Gibson, of Oliver + S.
Making solid progress on the two wall hangings I started in April (argh!) for the walls of the shop. I’ve had some design dissatisfaction, and have basically taken every opportunity to back-burner the project. Now’s the time to get this puppy done so it won’t be hanging over my head any longer (although, now that I think of it, it will quite literally be hanging over my head when it’s finished, so…). Have washed and tumble dried all the fabulous Patty Young knits that I picked out to make back-to-school out fits for the kids (including baby #4, because why should she be left out just because she’s so little?). Am here to tell you that the up-to-20% shrinkage warnings are accurate, but that the buttery-velvet softness of these fabrics is impossible to sum up in words–you really must try them! I love the start of a new school year. Fresh notebooks, clean backpacks, cheese sticks in the fridge. The absolute breath of possibility. The certainty that You Can Do It.